Phillip and Jan Diprose are passionate and enthusiastic people who value living well, working with positive people and making time for recreation and family. Currently, Phillip and Jan are deepening their connection with the land with their endeavours at Ochre Arch. Whether it is living ‘off-the-grid’ or letting the land naturally work for them, they are constantly finding new ways to manage their property in harmony with natural processes. Ochre Arch has been a family property since 1979 (through Phillip’s father) and was renamed after a natural ochre arch formation across one of the deep gullies. If you want to know even more about your hosts … read on …. Both grew up on family farms and headed off to the University of New England, with Phillip gaining a Bachelor of Agricultural Economics and Jan a Bachelor of Arts / Diploma of Education specialising in English History. Phillip’s agriculture based work experience included wheat/sheep farming, intensive pig production, cattle-station hand and grain sampler. While at the NAB Phillip was for a period the senior manager at Orange seeing him ‘on the other side of the desk’ dealing directly with a wide array of farmers and approving and recommending loan applications. 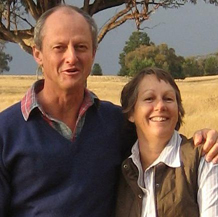 Since buying Ochre Arch in 2003 both Phillip and Jan have immersed themselves into learning as much as they can about regenerative agriculture. They have visited many properties, some as far away as the Kimberley region in WA, and attended numerous courses and field days. Some of these include Grazing for Profit/Holistic Management, Broadacre Biodynamic Agriculture, Natural Sequence Farming, Livestock Marketing, Low Stress Stockhandling and Natural Beekeeping. They are members of the Grassy Box Woodland Conservation Management Network, Meat and Livestock Australia and Australian Wool Innovation. For several years Phillip was Business Development Director for Holistic Management International / Australia which saw him negotiating agreements with various Natural Resource Management organisations and arranging courses for farmers. He initiated and led the Lachlan Grazing Management Project which involved 10 farming families located across the Lachlan Catchment using high density short duration grazing to enhance soil health, biodiversity and herbage mass production. Jan holds a Certificate III in Conservation Land Management from NSW TAFE and is presently Chairperson of the Weddin Community Native Nursery in Grenfell. In 2008 Phillip and Jan negotiated a Property Vegetation Plan with what was then called the Lachlan Catchment Management Authority. In short, in return for partial funding for additional fencing and a farm water scheme they have agreed to carry out conservation based grazing methods across the whole farm, with some areas having additional requirements due to their confirmed classification as Box Woodland Endangered Ecological Communities. New significant learnings connected with the farm are periodically documented and available to the public via the farm blogsite: Ochre Archives. Observations and farm activities are also shared on the Ochre Arch Farm Tours Facebook page. Bi-annual bird surveys are carried out on three locations on the farm by Birding NSW, off the back of Grenfell being recognised as a Significant Bird Area. So far just on 100 bird species have been identified. Phillip and Jan have been learning as much as they can about the aboriginal cultural heritage aspects connected with their farm, Ochre Arch. Renowned Aboriginal Archaeologist Sue Hudson has visited the farm on 3 occasions and made the discovery that the natural arch in one of the creeks was once mined by local aborigines for ochre. Off the back of this the arch is now registered on the NSW Aboriginal Heritage Information Management System. Sue has also vetted the small but diverse artifacts collection assembled by Phillip’s father in the 1960s, validating and explaining the various uses of each piece. Tom Knight (author of a Master’s thesis “Stepping stones to the Sky: Archaeological Perspectives on the Cultural Significance of the Weddin Mountains in recent Pre-History”) and Senior Lecturer in Archaeology at ANU Ian Farrington have both visited, as have Larry Towney, Senior Land Services Officer (Aboriginal Community, Central Tablelands Local Land Services, a cultural heritage officer from National Parks and Wildlife and a local Aboriginal Elder based at Young. Phillip family’s connection with the local area extends back to the early 20th century. He has a strong interest in local history and has been on the organising committees for both primary and secondary school reunions, and led the organising committee for the Diprose family centenary celebration at Greenethorpe in 2010. The prior ownership of Ochre Arch and some neighbouring farms has been researched in considerable detail. Phillip was elected Councillor for the Weddin Shire Council and is a member of the Heritage Committee. He was previously a Community Representative on the Tourism Committee where he initiated and led a working group that identified potential tourism attractions throughout the local Shire. Both Phillip and Jan are active members of the Weddin Wanderers walking group, with Phillip regularly identifying and checking out new walks; mostly on local private farming properties. The Ochre Arch Farm Tours enterprise was initiated in 2013. Many tours of the farm have been hosted since then with very positive feedback. Phillip’s 25 year career with the National Australia Bank saw the family move to and live in Sydney, Orange, Wollongong and Melbourne; with the ‘tree change’ to Pinnacle / Ochre Arch occurring progressively from 2007. Jan was immersed in all activities connected with raising their 3 children. Phillip has been involved in various fundraising events for charities, the most significant being leader of a team of approximately 100 volunteers raising funds for Melbourne Legacy during the years 2002-2004 – raising in each of the three years in excess of $11,000. In 2000 Phillip was a member of Choral Institute Melbourne which went to and competed as Australia’s only choir in the inaugural Choir Olympics at Linz, Austria. Jan is actively involved in volunteer work both with the Weddin Community Native Nursery in Grenfell and the Caragabal Branch of the Country Women’s Association. Together, Phillip and Jan have travelled to most major tourism destinations in Australia (all States and Territories) and to New Zealand, Austria and the United Kingdom. Phillip is also presently Treasurer of the Grenfell Men’s Shed – a vital supportive community organisation for local blokes with a strong focus on social interaction and mental health.